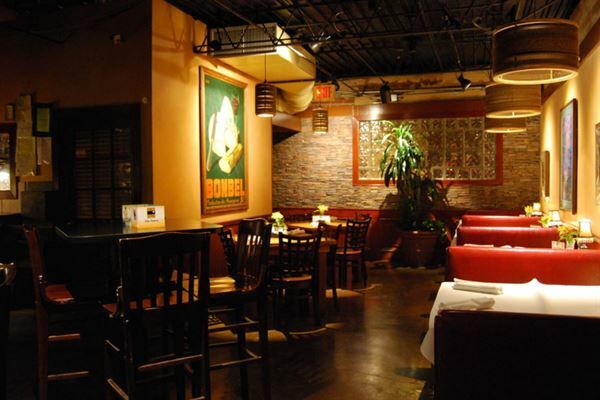 Whether you are on a date, ordering pre-dinner cocktails, indulging in after hours, or late-night revelry, our fun eclectic bar and bistro is where it’s at. The locals hang out here and bring out of town guests when they want to have an impressive evening filled with cocktails and conversation. Fun is the simplest description. Loca Luna feels like you’re in a trendy bistro in New Orleans or San Francisco, but with that special Little Rock hospitality. Our atmosphere is casual cool and you are comfortable in jeans, shorts, a dress, or a suit. The large bar features what most consider the best selection of spirits anywhere in the state. A lively Happy Hour during the week attracts a crowd of young professionals drinking assorted draft beers, wine, Margaritas, Cosmopolitans, and Martinis. And after almost 20 years in the business our experienced bar and server team shows no signs of slowing down. We serve expertly crafted cocktails and feature a wine list second to none in our neck of the woods. At Loca Luna, we make our customers feel like they are family. Pizza & Salad Buffet | $16.00 per person • Wild Green House Salad with Homemade Dressing • All You Can Eat Assortment of any of our Famous Wood-Fired, Brick Oven Pizzas. Pick any three pizzas: - Fried Pepperoni Bacon. “The Best Pepperoni On the Planet" - Bacon and Brown Sugar Grilled Pineapple with Caramelized Onions and Basil - Four Cheese. Mozzarella, Provolone, Romano and Parmigiano-Reggiano - Fresh Spinach, Shiitakes and Portabella Mushrooms. Red Onions, Fresh Tomatoes - Bar-B-Que Chicken and Caramelized Red Onions. Tequila Cranberry Bar-B-Que Sauce - "Damn Good" Vegetarian and Ozark Goat Cheese, Spinach, Roasted Red Bells, Fresh Basil, Red Onion, Fresh Tomatoes - Grilled Shrimp, Roasted Red Bell Peppers, Caramelized Onion, Tomatoes and Basil - “Poke Meat & Maters” Honey Cured Ham, Crisp Peppered Bacon, Tomatoes and Basil - Southwestern Grilled Chicken, Goat Cheese, Black Beans, Peppers, Red Onions and Salsa - Meat Me. Sausage, Bacon, Pepperoni, Ham, Red Onions, and Red Bell Peppers Santa Fe Buffet | $17.00 per person • Sizzling Chicken and Beef Tenderloin Fajitas with Sautéed Peppers and Onions. With: Tortillas, Shredded Lettuce, Guacamole, Cheese, Sour Cream, Pico, Fiesta Black Beans, and Santa Fe Rice • Excellent Add-on: Our Famous Cheese Dip and Salsa Old Fashioned "Blue Plate Specials" | $16.00 - 18.00 per person (buffet or plated) • Wild Greens Salad with Homemade Dressing • Choice of Two Entrees: - “Chicken Fried Chicken” Tenderloin Breast Strips with Cream Gravy - Grilled Mahi Mahi Filet with Lemon and Spices - Chicken Fried Steak with Pan Dripping’ Cream Gravy - Delta Meat Loaf Classic Style with Roasted Tomato Sauce - Grilled Marinated Boneless Chicken Breast - Slow-Cooked Southern Pot Roast with Vegetables and Mushrooms • Choice of Four Sides: - Black Eyed PeasSquash, Casserole, Sautéed Seasonal Vegetable Medley, “Real” Mashed Potatoes with Cream Gravy, Buttered Cooked Cabbage, Fresh Turnip Greens with Bacon, Green Beans with Almonds, Macaroni and Cheese, Roasted New Potatoes, Sweet Corn Kernels, Saffron Rice Blend, Fiesta Black Beans Light Gourmet Lunch - Plated | $16.00 per person • Wild Greens Salad with Homemade Dressing • Choice of Any Two Entrees: - Seasonal Fresh Fruit Salad - Creamy Roasted Red Bell Pepper Soup - Lobster and Crab Bisque - Grilled Chicken and Veggie Pasta Alfredo Northern Italian Lunch | $16.00 per person • Italian or Caesar Salad (Choose One) • Parmesan Garlic Cheese Bread • Choice of Entree: - Meatballs. Two Meat balls made with Beef, Pork, Sausage, and Veal, Topped with Mozzarella and Provolone Cheese, Over Capellini pasta with Tomato sauce - Beef and Sausage Lasagna. Topped with Cheese, Basil and Tomato Sauce - Grilled Chicken Alfredo Casserole. Linguini, Sautéed Portabellas, Onions and Red Bells. Smothered in Creamy Alfredo Cream Sauce with Cheese - Seafood Alfredo Casserole. Linguini, Sauteed’ Portabellas, Onions, Red Bell Peppers, with Shrimp, Scallops, and Lobster. Smothered in a Creamy Alfredo Sauce All Prices Subject to Change.